Paul arrived in our lives on Wednesday, April 15, 2015. We had been anticipating his arrival for quite some time and we already knew he would be extraordinary. Immediately after his birth, tests quickly confirmed Down Syndrome as well as a cardiac abnormality that would require open heart surgery within his first months of life. From the first hours after he was born, dad and I took turns at his bedside keeping him warm with skin to skin contact. Babywearing was a natural choice as we didn’t want Paul to be anywhere else but right against our hearts. I wore him, rocked him, cuddled him; at home, on the road, in hospital hallways, to and from exams and appointments, and also simply for the sheer joy of it. For the only reason that I wanted to take in all that he had to give. Babywearing took on a big role in our lives and during all those difficult and stressful moments, it was not only imperative that I kept Paul close to me, but vital to my confidence as a mother and as a woman. I did not have any control over the events that were unfolding; fear and the unknown were constants in our daily lives but giving my baby this comfort, this closeness, this security and an abundance of love was a tangible way of making sense of this frightening whirlwind. It is also through babywearing that I was able to discover an exceptional community. I met extraordinary mothers and developed close friendships. I found support, willing listeners and incredible open-mindedness. This support system has made a huge difference in our journey and has brought us so much comfort. Paul underwent open-heart surgery at the age of two months. He left for the operating room the morning of June 25th, enveloped in our favorite woven wrap. He returned to us with a freshly mended heart and a tiny scar so we would not forget the warrior he had become. As we learned more about Down Syndrome, we discovered that it is often associated with delays in gross motor skills such that children are likely to walk a little bit later than average. What joy! I knew it would be a pleasure to hold him close to me and to help him discover the world wrapped snugly on my back. We would follow his rhythm and adapt our lives to him. Little by little, my appreciation for wraps evolved into a true passion. I was a seasoned knitter with years of experience and was already a lover of fibers, fabrics and design. It was inevitable that I would fall into the rabbit hole! Not only did this textile art help make me feel beautiful and elegant, but I was able to carry the most precious thing in the world to me, my baby. 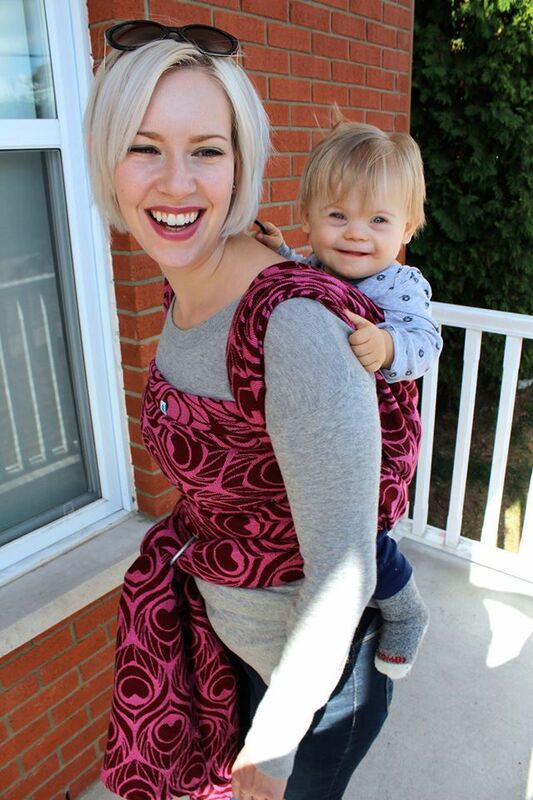 The world of babywearing has provided me with a number of opportunities to demystify and familiarize people with Down Syndrome, and to open their eyes to the differences we encounter in our daily lives. This has also led to becoming a certified babywearing educator, allowing me to share my love and passion for babywearing and wraps. My dream is for every mother to have the necessary tools and support to forge this crucial bond that is so important between her and her child, particularly with children with special needs. True beauty can be found in our differences, our diversity and our relationships with others and I really believe that being able to babywear my son reflects all of this. For me, wraps become an extension of my internal beauty and my maternal love, one carry at a time.